Of all the occasions that require the use of a suit, there is none more important than a wedding. From the bride and groom to the family friends attending as guests, a wedding is often the biggest date in anybody’s diary. There is also a big part to play in the ceremony for the young boys who have been selected as page boys, and they are often given the responsibility of carrying the rings down the aisle in front of all attendees. As a page boy, looking the part is essential and the suit is the most part of looking good. 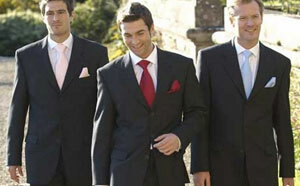 Boys wedding suit hire gives the chance for a suit to be purchased for the wedding and then returned afterwards. This makes it an excellent alternative to buying a suit which will only be used once. What does a boys wedding suit look like? There is no one set look for a wedding suit and fabrics. Styles and colours are available in hundreds of variations. Boy’s wedding suit hire, particularly the page boys, will be matching of those worn by the groom, best man, fathers of the bride and groom and ushers. The style and colour will be chosen by the groom and suits provided to necessary parties. Not all suit hire companies will have the facilities to provide suits for children, and it is important for the groom to find a company that does if they intend to have the page boys matching the rest of the party. The fitting is a very important part of boys wedding suit hire. Weddings are generally planned months and even years in advance. The suits are generally sorted in the early days of planning to avoid disappointment closer to the big day. This means measurements, and fittings will be carried out long before the suit is actually needed, in most cases this will not be a problem for adults. However, for children it will be. Boys will grow between the first fitting and the wedding day, and it is important that adjustments are made to a suit to reflect this. In these instances, it will be important to keeping in regular contact and visit the hire shop to be sure a suit fits perfectly when the time comes. Finding a company that provides an array of sizes is beneficial to cover any changes, some companies have sizes that start as young as 12-18 months. Many companies will provide boys wedding suit hire with the option of insurance. It can be beneficial to include this extra in the hire term. Insurance generally costs around £5-£10 and is designed to cover any accidental damage, for instance, spilt drinks or food stains. Weddings can be long days, and a suit will be worn from morning until night and through meal times, those with children, especially young boys, will understand how hard is to keep clothes clean for a long period of time.